Litter box options and tips for your disabled rabbit. There are many disabled rabbits that are still capable of using a litter box. These rabbits may be arthritic rabbits, senior rabbits, some "tripod" rabbits, and others. Commonly, they do need a special litter box setup to make using one more accessible and convenient considering limitations they may have. Here are some setups and ideas to help you choose a litter box setup for your disabled rabbit. Rabbits that have disabilities or conditions of some kind need a litter box that suits their limitations. This typically means a box with a low front that enables them to enter and exit the box easily. A rabbit struggling with arthritis may be slow at hopping and may not be able to make it over the high side of most litter boxes. A rabbit missing one of their front or back legs may get caught trying to make it into a deep box. In cases such as these, try to look for a box with a low front and/or a shallower tray. There are some available in major pet stores, but you can also find a suitable box on many sites online. Use the pictures above as ideas to guide you in your search. Also keep in mind that a larger litter box is usually better for a disabled rabbit. Physically-impaired rabbits often have trouble turning and maneuvering around. The tight space of a small litter box will not work for them. An option in this case could be to use a larger tub with a low lip in front for easy access. You can also fashion your own litter bin from a storage tub by cutting a lip in the center of one side of the tub. The goal is to give your rabbit as much floor space in their bin as possible to enable them to move about it easily. A great option for a litter box for your disabled rabbit is Bingaling Bunnybox's Geriatric Litter Box. This litter box is designed to allow for easy entry, but still has a small lip on the front to help keep the litter in the bin. The bin is solid and smooth, not 'bendy,' which is great for support. It also has rubber pads underneath it to help keep it from slipping on flooring. 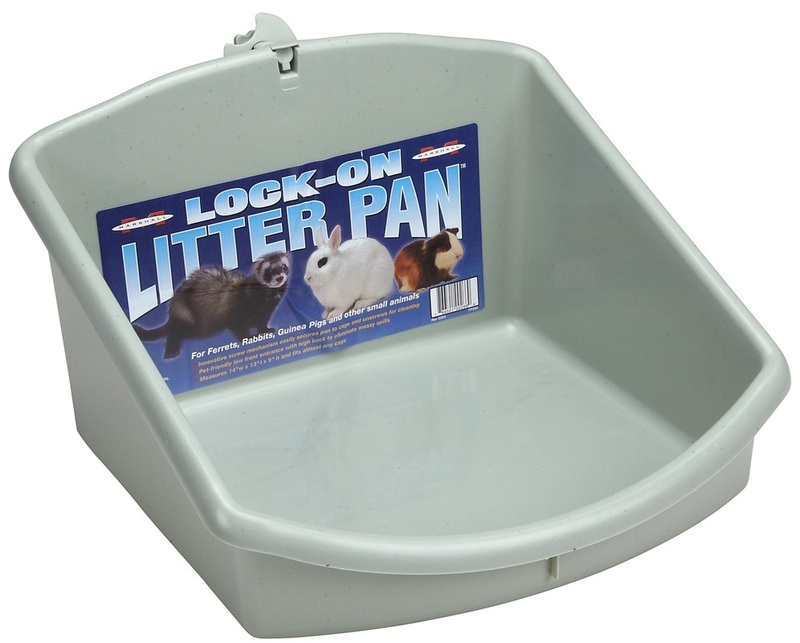 Another option for an easy-access litter pan is the Puppy Go Here Litter Pan. This litter box is designed for pets and is available in multiple sizes for smaller or larger breed rabbits. It's smooth, lower entrance is great for geriatric or otherwise disabled rabbits who can still use a litter box, but need one that's more easily accessible. 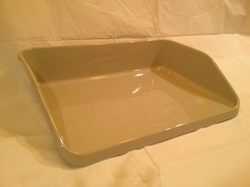 A good low-entry litter box is the Marchioro Feeding Tray. Actually designed to hold pet food dishes, this tray makes a convenient and easy-use litter box for a disabled rabbit. It has a low lip in front to keep litter in the bin while not hindering a disabled rabbit from entering. The tray also has rubber feet on the bottom to keep it from slipping. We realize it may sound a bit odd, but an Argee Table-Top Potting Tray can actually work quite well as a low entry litter box for a less mobile rabbit. This tray can hold litter easily while still providing a low, smooth entrance for a disabled rabbit. The higher sides help provide lots of side support, which can be particularly helpful for wobbly or head tilt rabbits. This tray is rather large, so it's more appropriate for a larger rabbit or for one who needs more space to move around. Here's another gardening item that can also make a great low entry litter box option. The Tierra Garden Tidy Tray is actually meant to be a gardening workspace, but the low front and slight lip around the front and sides make it perfect for a disabled bunny litter box. It can hold litter while still allowing for easy entry. It is made of hard plastic (so it doesn't bend) and is waterproof. The ZTDM Plastic Pet Potty is another choice for a low entry litter box. It comes with an optional plastic grate. If you remove the grate, the tray could hold litter or bedding. The higher sides and low front make it easy entry for a disabled rabbit. This tray is also available in a larger size here. Disabled rabbits are different in their litter box use in that they often require more traction and support inside the bin. For instance, a rabbit suffering from arthritic problems may have trouble slipping inside the bin, especially after hoping inside. So, it is up to us to make sure that they their litter bin is set up safely for their use. Here are a few thoughts and ideas for how to make a litter box suitable for a disabled rabbit. 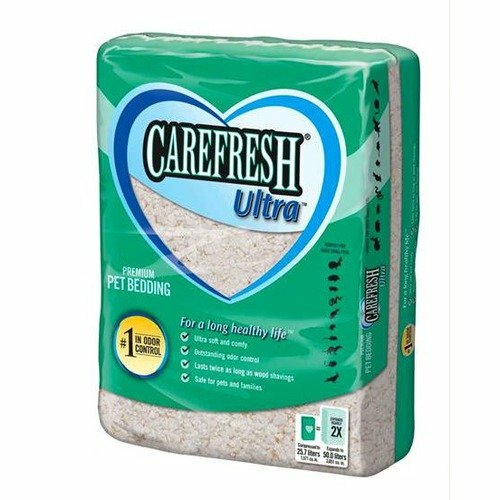 The first thing you may want to try with your disabled rabbit is switching their litter to a paper pulp litter, such as Carefresh. These types of litters are much softer and less slippery than pelleted litters that tend to slide around when stepped on. They also absorb urine fairly well. Another option could be to line the bottom of the litter pan with a small rubber-bottomed bathroom mat. This will help give your disabled rabbit some traction against the slippery floor of the litter box. Place a light layer of a pelleted rabbit litter on top of the rug. The rug will absorb any urine that gets through and can be exchanged, washed and replaced cheaply and easily. Use the idea above, but instead try using a good layer of a heavy hay, such as oat hay, on top of the mat instead of a pelleted litter. The hay will give your rabbit a soft and non-slippery litter area that is also safe to eat. Another option would be to line the bottom of the litter pan with a small washable pee pad such as those used for dogs. These can be purchased online- We recommend PoochPads. They are designed to absorb and hold urine while remaining relatively dry on the surface. They are soft and provide lots of grip for your rabbit's feet. Purchase a few and exchange them and wash them as needed. Use the idea above, but try adding a light layer of paper pulp litter such as Carefresh around the top of the pad. This will add an additional substance to absorb urine while also maintaining the softness and grip of the pad. A more modern idea is to use a fleece mat to line a litter bin rather than using a conventional litter. These can be purchased online- We recommend Pet Rabbit Toys Sleeping Pads. They are designed to absorb and hold urine and are said by producers to be suitable for lining a bin, which would be excellent for a disabled rabbit. They are soft and supportive and are designed to wick urine downwards and away from your rabbit. Purchase a few and exchange them and wash them as needed. Use the idea above, but try adding a light layer of a paper pulp litter such as Carefresh around the top of the fleece mat. 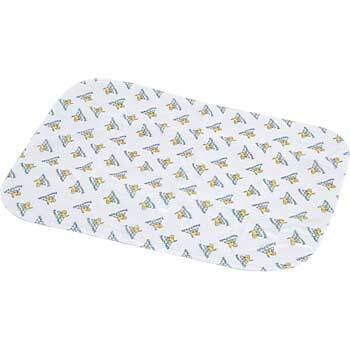 This will add an additional substance to absorb urine while also maintaining the soft feel of the fleece mat.